This weekend will see three new wide releases vie for a piece of the hot summer market. - Regardless of industry criticism, Adam Sandler still boasts a notable family audience that typically show up for his more accessible films. - The recent wave of nostalgia-driven box office successes could carry over to this pic with multi-generational appeal. - Flixster and Facebook activity are encouraging for what is, technically, a non-franchise/non-sequel film. - Sandler's audience has nevertheless diminished in recent years, with the Grown Ups films being the exceptions to that rule. - In an already fairly crowded summer, audiences may not view Pixels as a need-to-see type of movie. - Twitter activity leaves much to be desired. - Author John Green has quite a few young adult fans thanks to last year's hugely successful The Fault In Our Stars. - In general, young adult films are still strong properties right now. - With nearly 1.4 million Facebook fans and strong Twitter movement this week, there's definitely a young audience out there for this. - Shailene Woodley's popularity was increasing at the right time before Fault last year. Unfortunately, neither of the two stars here are in quite the same league of recognition yet. - Flixster activity is relatively soft for the genre. - With so much competition in the market, this could have a hard time breaking out beyond the core teen demo. - Adults looking for something other than a popcorn movie may find a welcome reprieve in this. - Jake Gyllenhaal continues to take on challenging performances, something his fans will probably turn out for. - Twitter buzz is increasingly strong. - Reviews are heading in the wrong direction, which unfortunately could hurt the film's outlook before it even opens. - Flixster and Facebook activity haven't done much to impress. - Marketing for the somewhat under-the-radar summer release has been modest. 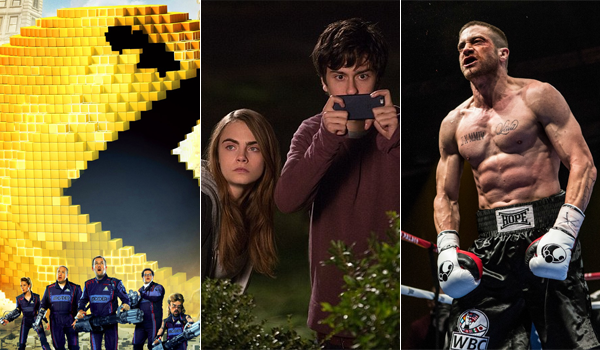 We're forecasting a $169.4 million gross from this weekend's top ten films. That would represent a 28 percent increase from the same frame last year, which generated $132 million and was led by newcomers Lucy ($43.9 million) and Hercules ($29.8 million).